If the ducts in your home are poorly sealed and insulated or aren't insulated at all, they could be costing you hundreds of dollars a year on your heating and cooling bills while also making rooms in your home uncomfortable. Ductwork that's located in an attic or vented crawl space can make problems even worse. You can save money, make your home safer and more comfortable and reduce noise by sealing and insulating your ducts. If you're looking for a professional to help with insulating your ductwork, contact the insulation experts at Air Inc. Heating and Air Conditioning today to schedule your in-home consultation and get a free cost estimate. We serve Branford, Guilford, North Haven, and the surrounding areas! Ducts have lots of joints, gaps, and holes which are perfect for leaks. The leaks only get worse when the air handler is turned on. Thus all this air that you paid to heat or cool is dispersed into the air of your attic or crawl space without doing its job. Consequently, you end up paying more for the same results. Air Inc. Heating and Air Conditioning can help by installing duct insulation. Choosing the right insulation can be tricky for the inexperienced, but our experts can do the job before you. We'll carefully inspect your ductwork and then choose insulation with the perfect R-value for the job. Once the new insulation is installed your furnace or air conditioner will heat or cool the air and you can be confident that it will be delivered to your rooms without loss along the way! While the average homeowner can find duct insulation products in home improvement stores like duct wraps and duct sleeves, it's not recommended to try a DIY installation. In fact, the U.S. Department of Energy suggests you find a qualified contractor for duct insulation and sealing to make sure the job is done right. Are you ready to get started saving money by making your home more energy efficient? 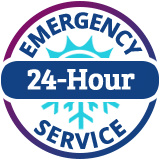 Contact us today online or at 1-844-359-5454 and schedule your free estimate for any of our services in East Haven, Madison, New Haven, Hamden, West Haven, Milford, Woodbridge, and the surrounding area!